The cutting of a line block needs patience and care and skill, but it is not the most difficult part of print making, nor is it so hopeless an enterprise as it seems at first to one who has not tried to use the block-cutter's knife. In Japan this work is a highly specialised craft, never undertaken by the artist himself, but carried out by skilled craftsmen who only do this part of the work of making colour prints. Even the clearing of the spaces between the cut lines is done by assistant craftsmen or craftswomen. 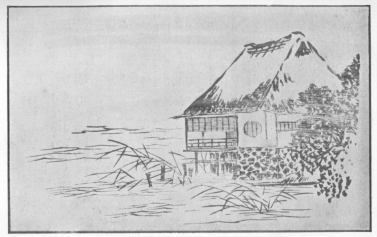 The exquisite perfection of the cutting of the lines in the finest of the Japanese prints, as, for instance, the profile of a face in a design by Outamaro, has required the special training and tradition of generations of craftsmen. The knife, however, is not a difficult weapon to an artist who has hands and a trained sense of form. In carrying out his own work, moreover, he may express a quality that is of greater value even than technical perfection. At present we have no craftsmen ready for this work--nor could our designs be safely trusted to the interpretation of Japanese block-cutters. Until we train craftsmen among ourselves we must therefore continue to cut our own blocks. A set of blocks consists of a key-block and several colour blocks. The block that must be cut first is that which prints the line or "key" of the design. By means of impressions from this key-block the various other blocks for printing the coloured portions of the design are cut. The key-block is the most important of the set of blocks and contains the essential part of the design. A drawing of that part of the design which is to be cut on the key-block should first be made. This is done on the thinnest of Japanese tissue paper in black indelible ink. The drawing is then pasted face downward on the prepared first block with good starch paste. It is best to lay the drawing flat on its back upon a pad of a few sheets of paper of about the same size, and to rub the paste on the surface of the block, not on the paper. The block is now laid down firmly with its pasted side on the drawing, which at once adheres to the block. Next turn the block over and lay a dry sheet of paper over the damp drawing so as to protect it, and with the baren, or printing rubber, rub the drawing flat, and well on to the block all over. With regard to the design of the key block, it is a common mistake to treat this as a drawing only of outlines of the forms of the print. Much modern so called decorative printing has been weak in this respect. A flat, characterless line, with no more expression than a bent gaspipe, is often printed round the forms of a design, followed by printings of flat colour, the whole resulting in a travesty of "flat" decorative treatment. The key design should be a skeleton of all the forms of a print, expressing much more than mere exterior boundaries. It may so suggest form that although the colour be printed by a flat tint the result is not flat. When one is unconscious of any flatness in the final effect, though the result is obtained by flat printing, then the proper use of flat treatment has been made. The affectation of flatness in inferior colour printing and poster work is due to a misapprehension of the true principle of fiat treatment. As an illustration of the great variety of form that may be expressed by the key-block, a reproduction is given (see below) of an impression from a Japanese key-block. It will be seen that the lines and spots express much more than boundaries of form. In the case of the lighter tree foliage the boundaries are left to be determined entirely by the subsequent colour blocks, and only the interior form or character of the foliage is suggested. The quality or kind of line, too, varies with the thing expressed, whether tree, rock, sea, or the little ship. The design, too, is in itself beautiful and gives the essential form of the entire print. The study of the drawing of any of the key-blocks of the Japanese masters will reveal their wonderful power and resource in the suggestion of essential form by black lines, spots, and masses of one uniform tint of black or grey. 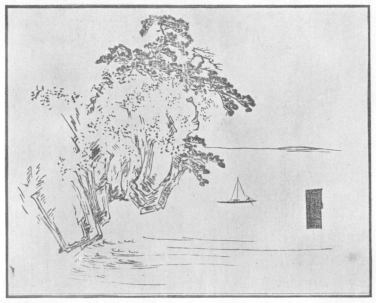 The development of this kind of expressive drawing is most important to the designer of printed decoration, whether by wood blocks, or lithography, or any other printing process. Another good type of drawing for the purposes of key-blocks in wood is given above. When the key-block with its design pasted upon it is thoroughly dry, a little sweet oil should be rubbed with the finger at that part where the cutting is to begin, so as to make the paper transparent and the black line quite clear. In order to keep the block from moving on the work-table, there should be fixed one or two strips of wood screwed down, to act as stops in case the block tends to slip, but the block should lie freely on the table, so that it may be easily turned round during the cutting when necessary. One should, however, learn to use the cutting knife in all directions, and to move the block as little as possible. The knife is held and guided by the right hand, but is pushed along by the middle finger of the left hand placed at the back of the blade, close down near the point. 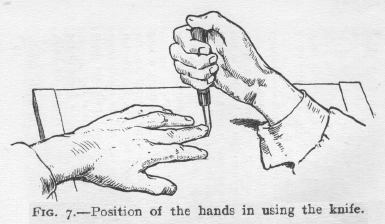 The left hand should be generally flat on the work-table, palm down, and the nail of the middle finger must be kept short. This position is shown in Fig. 7. 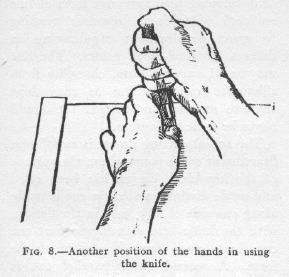 Sometimes it is convenient to drive the knife from right to left, but in this case the pressure is given by the right hand, and the left middle finger is used to check and steady the knife, the finger being pressed against the knife just above the cutting edge. A good position for cutting a long straight line towards oneself on the block is shown below (fig. 8). 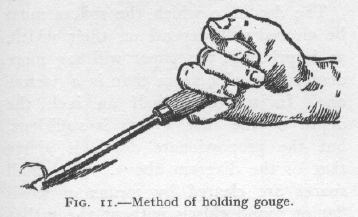 The left hand is on its side, and the middle finger is hooked round and pulls the knife while the right hand guides it. In all cases the middle finger of the left hand pushes or steadies the knife, or acts as a fulcrum. A beginner with the knife usually applies too much pressure or is apt to put the left finger at a point too high up on the blade, where it loses its control. The finger should be as close down to the wood as possible, where its control is most effective. A small piece of india-rubber tubing round the knife blade helps to protect the finger. With practice the knife soon becomes an easy and a very precise tool, capable of great expressiveness in drawing. Bear in mind that both sides of a line are drawn by the knife. The special power of developing the expressive form of line on both sides is a resource tending to great development of drawing in designs for wood-block prints. The line may be of varying form, changing from silhouette to pure line as may best serve to express the design. It should never be a mere diagram. Starting at some point where the surface of the key-block design has been oiled and made distinct, a shallow cut is made along one side of any form in the design, with the knife held slanting so that the cut slants away from the edge of the form. A second outer parallel cut is then made with the knife held slanting in the opposite direction from the first, so that the two cuts together make a V-shaped trench all along the line of the form. The little strip of wood cut out should detach itself as the second cut is made, and should not need any picking out, or further cutting if the first two cuts are cleanly made. This shallow V-shaped trench is continued all round the masses and along both sides of all the lines of the design. No clearing of the intervening spaces should be attempted until this is done. It will be seen at once that the V-shaped cuts give great strength to the printing lines, so that a quite fine line between two cuts may have a strong, broad base (fig. 9). The depth of the cut would be slightly shallower than that shown in this diagram. In cutting fine line work a cut is first made a little beyond the line, then the cut is made on the line itself (fig. 10). Where a very fine line is to be cut, especially if it is on a curve, the outer cut of the V trench should be made first, and then that which touches the line: there is thus less disturbance of the wood, and less danger of injuring the edge of the line. When the V cut has been made outside all the lines, one proceeds to clear the intervening spaces between the lines of the design by taking tool No. 1 (fig. 5). The large spaces should be cleared first. The safest and quickest way is to make a small gouge cut with No. 1 round all the large spaces close up to the first cut, then, with one of the shallower chisels, Nos. 5, 6, or 7 (fig. 5), and the mallet, clear out the wood between the gouge cuts. For all shallow cuts where the mallet is not needed, the Japanese hold the chisels as shown in fig. 11 [Ed. note]. With practice this will be found a very convenient and steady grip for the right hand. It has also the advantage that the chisel can be held against the centre of the body and exactly under one's eyes. In the diagram (fig. 12), if the wood from A to A1 is to be cleared away, gouge cuts are made at b and b1, then the space between b and b1 may be quickly cleared without risk to the edge of the form at A. When this rough work is done the little, ridge between A and b may be cleared with small round or flat tools, as is most convenient. But this final clearing should not be done until all the large spaces are roughed out. 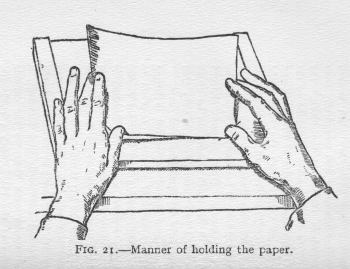 The depth to which the spaces must be cleared will depend on their width, as, in printing, the paper will sag more deeply in a wide space than in a narrow one. In spaces of half an inch the depth of the first V-cuts is sufficient, but the proportionate depth is about that of the diagram above. The small spaces are cleared by means of small flat or round chisels without the mallet or the preliminary gouge cut: this is only needed where a large space has to be cleared. There remain now only the placing and cutting of the two register marks or notches for controlling the position of the paper in printing. The corner of the print fits into the notch at A, and one edge of the print lies against the straight notch at B. The register marks may be even closer to the space covered by the design, but must not actually touch it, as some margin of paper is necessary in printing they should also be cut always on the long side of the printing block. 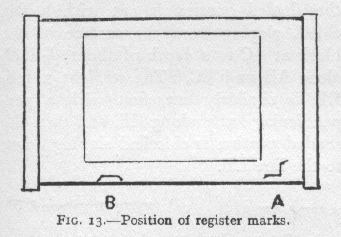 It will be seen from this drawing that these register marks correspond to the position of the thumb of each hand in laying the paper on the block for printing. The corner mark, ABC, is made by cutting from A to B and B to C, with the knife held perpendicularly, and its flat side against the line, then the shaded portion is cut with a flat chisel, sloping from the surface of the block at AC to a depth of about 1/16 inch along AB and BC. 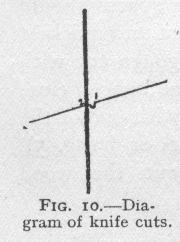 The straight notch, EF, is similarly cut, first with a perpendicular knife along EF, and then the shaded portion is chiselled sloping down to the line EF. The register marks must be smoothly and evenly cut so that the paper, in printing, may slide easily home to its exact place. When the design of the key-block and the two register marks have been cut and cleared, the trace of paper and paste on the uncut parts of the wood should be carefully washed off with a piece of sponge and warm water. The block is then finished and ready for use. The key-block, however, is only one of the set of blocks required for a print in colour, but the colour blocks are simpler and require, as a rule, far less labour. The colour blocks are planned and established by means of impressions taken from the key-block. For this purpose the register marks are inked for printing as well as the design on the block, and the impressions must include both. These impressions are taken on thin Japanese paper, but not necessarily the thinnest tissue. If the thinnest is used, it should be pasted at the corners to a sheet of stiffer paper for convenience in handling. It is then a fairly simple matter to take one of these key-block impressions and to make a plan of the various colour blocks that will be required. These should obviously be as few as possible. It is not necessary to provide an entire block for each patch of colour, but only the extent of surface required for each coloured portion of the print, as well as for its pair of register marks. Patches of different colour that are not adjacent to one another on the design of the print may be cut on the same block, provided they are not too close for free colouring of the block in printing. Each block also may be cut on both sides, so that there is considerable scope for economy in the arranging and planning of the colour blocks. When the arrangement of the plan of colour has been simplified as far as possible, a new block is prepared as described above, and a sheet of thin Japanese paper (unsized) is cut large enough to cover the print design and its register marks. The clean surface of the new block is covered thinly with starch paste well rubbed into the grain, and while this is still wet an impression on the sheet of thin Japanese paper is taken of the entire key-block, including its register marks in black, and laid before it is dry face downward on the pasted surface of the new block. This should be done as described above. It should be rubbed flat with the printing pad and left to dry. This operation requires careful handling, but it should be done easily and methodically, without any hurry. Each side of the set of colour planks should be treated in the same way-a thin impression of the key-block and its register marks being laid upon each. It is advisable to paste down a freshly taken impression, each time, while the ink is still moist, for if these are allowed to dry, the shrinking of the paper causes errors of register. When these new blocks are dry, the patch of colour to be cut on each surface should be clearly indicated by a thin wash of diluted ink or colour, but not so as to hide the printed key line. When the register marks corresponding to these colour forms have also been cut, and the paper washed off the blocks, the clear spaces may be used for pasting down new key impressions for the smaller colour patches and their corresponding register marks. In this way one side of a colour plank may contain several different colour forms and sets of register marks. As a rule the different colour patches would be printed separately, though in some cases two colours may be printed at one impression if they are small and have the same register marks. When the blocks have been cut and cleared it is advisable to smooth with sand-paper the edge of the depression where it meets the uncut surface of the wood, otherwise this edge, if at all sharp, will mark the print. For any particulars about which one may be in doubt, the sets of blocks at South Kensington Museum or in the Print Room at the British Museum are available for examination. In one of the sets at the British Museum it is interesting to see the temporary corrections that have been made in the register marks during printing by means of little wooden plugs stuck into the register notches. In nearly all cases the Japanese blocks were made of cherry wood, but planks of box are said to have been occasionally used for very fine work. 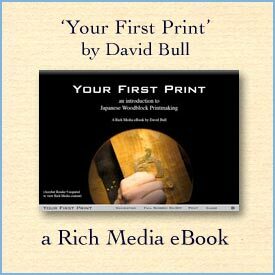 However exactly the register marks may be cut in a new set of blocks, very puzzling errors occasionally arise while printing, especially if the planks are of thin wood. Some of the blocks are necessarily printed drier than others. For instance, the key-block is printed with a very small amount of ink and paste. Other blocks may be even drier, such as the blocks which print small forms or details in a design. The blocks, however, which are used for large masses of colour, or for gradated tones, are moistened over the whole or a large part of the surface of the block, and if the wood is thin, and not well mounted across the ends, the block soon expands sufficiently to throw the register out. If the block is not mounted across the ends there will also be a tendency to warp, and this will add to the errors of register. But if the blocks are of fairly thick wood, and well mounted, the register will remain very exact indeed. Usually the key-block is printed first. If the subsequent blocks are not in exact register the error is noticeable at once, and slight adjustments may be made for its correction. But in cases where the key-block is printed last (as sometimes is necessary) each colour block must be tested before a batch of prints is passed over it. For this purpose the first few prints of every batch should receive a faint impression of the keyblock, so that the register of the colour impression may be verified before proceeding with the whole batch. If these precautions are taken, and the entire set of blocks kept as nearly as possible in the same conditions of dryness or moisture, all difficulties of register in printing will be easily overcome. When cutting a new set of blocks there is another possible source of error which needs to be carefully guarded against. Most of the work in designing a new print is necessarily spent in planning and cutting the key-block, which may occupy a considerable time, especially if other work has to be carried on as well. If new wood is used, or wood that has not been seasoned long indoors, it will dry and contract considerably across the grain before the work is finished. Then, if newer planks are prepared and cut up for the colour blocks, and impressions from the keyblock are pasted down on them for cutting, it will be found that, as the newer wood of the colour-blocks goes on drying, it will shrink out of register, and the colour impressions will not fit the line perfectly. It is easy to fall into this difficulty, but there is no danger of it if the planks from which the key-block and the colour-blocks are cut are all equally seasoned and are in the same condition.